In one of the sunny summer morning, no one cannot imagine that we will participate in the competition from Mercedes-Benz. It sounds very cool and scary at the same time. What is the idea of the contest? Mercedes-Benz wants you to develop innovative ideas and inspiring solutions that help shape the future of sales, services, and financing of premium cars and mobility. What will the classic car dealership of today look in ten years? How will digital services increase brand loyalty and customer satisfaction? How will we go about paying, leasing, and accessing premium mobility solutions in the future? It seems everything is clear. But in fact, it is very difficult to come up with something really interesting and Innovative for such a large concern as the Mercedes-Benz. Of course, a company of this size can afford a lot of things, but we have set ourselves the task to do something that could easily bring to life and was available to everyone. Word availability, we consider not only in the social aspect but also in the literal sense. What if a sitting on the couch at home you could ride on your favorite model car? Or sitting at work, or while waiting for a child from school? The answer to our questions, we found in this decision as a virtual reality glasses. Last time, they have become very popular and offer opportunities for people to gain experience in virtual reality in a simple, fun and accessible way. Once you have it, you can explore a variety of apps that unfold all around you. So we start to working on this idea. Plus points is that they are easy to assemble, eco — friendly, cheap and can be ordered with your custom brand. It was particularly difficult to come up with the style of our design concept. We wanted to do something unreal, we wanted to impress, but then we sat down to look at a Mercedes car and understood. All good things looks thought out simply and succinctly. There is no need to reinvent the wheel where it is unnecessary. Therefore we made as simple and concise our design so as not to distract from the product that we represent. Now we have to decide what we will show to people through these points. Our concept is to store of Mercedes Benz to transfer to your mobile phone. Many do not go to the stores because they do not have the time or know that such an expensive car they can not buy or they do not like annoying consultants. But when you’re at home, you feel completely comfortable and nothing distracts you. MIA explains not only how to buy a car or book a test drive at a specific time. 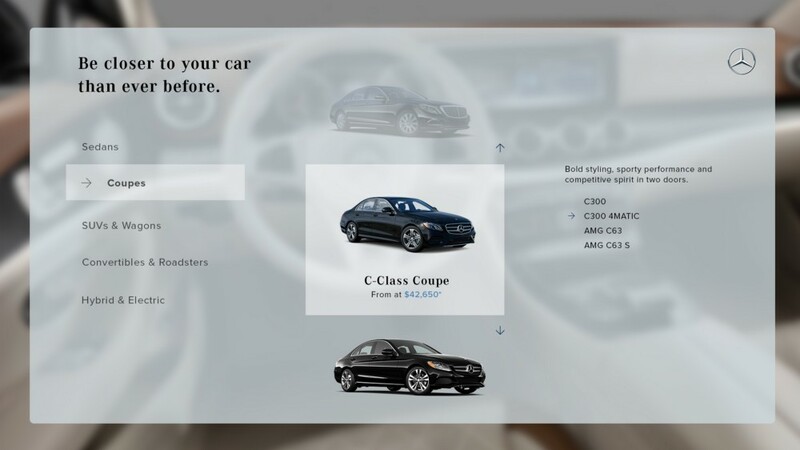 But much more- you can order a virtual test drive. It allows you to ride on your favorite Street or the Champs-Elysees for example, or in the most picturesque road plans. Furthermore, you will be offered the opportunity to change the interior color, change the engine or even tires. Just imagine that you can ride on the car of your dreams without leaving home and not be afraid that it can scratch or even break. In some way, we present Mercedes VR showroom. Well, it seems to me, I said enough, now it’s time to show how we imagine our concept in real life. We are satisfied with the work done and the results that came out, and apparently the concern Mercedes also liked. After all, we won competition. P.S. And if until competition deadline there are only 3 days left, and you have no idea, never give up.